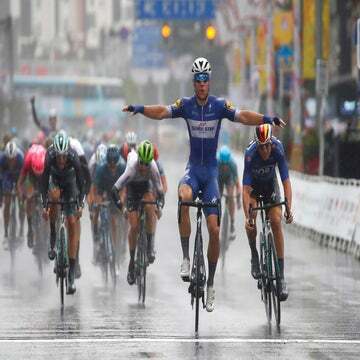 Matteo Trentin (Mitchelton-Scott) won the penultimate stage of the Tour of Guangxi on Saturday as fellow Italian Gianni Moscon (Team Sky) kept the overall race lead in China. In fog and rain, the 29-year-old Trentin streaked home for victory from a reduced sprint in the 212.2-kilometer stage five from Liuzhou to Guilin in 4:54:34. “It was really good today, we knew that if we did the climb hard then the top sprinters would be tired to do the sprint,” said Trentin. An initial breakaway of talent made up of Silvan Dillier (AG2r La Mondiale), Tony Martin (Katusha-Alpecin), Pascal Eenkhorn (LottoNL-Jumbo), and Ryan Mullen (Trek-Segafredo) was caught by the peloton as the race entered the hilly finale. The pace-setting in the bunch was largely made by Team Sky, protecting race leader Moscon, and Bora-Hansgrohe, looking to set up their fast man Pascal Ackermann. The peloton split on the third and final climb of the day, with the first category ascent sufficient to take the kick out of the pure sprinters. Trentin took victory from a reduced sprint impacted by a crash in the final 300 meters, with Pascal Ackermann (Bora-Hansgrohe) and Jasper Stuyven (Trek-Segafredo) placing second and third respectively. “I am really happy because it is my first win with the team and my first win in the European kit before the end of the season,’ said Trentin. Team Sky’s Moscon was seventh, enough to maintain his lead over his rivals in the general classification. The 24-year-old has a nine-second advantage over Austria’s Felix Grossschartner of Bora-Hansgrohe, with Russia’s Sergei Chernetski, riding for the Astana team, 14 seconds off. Sunday is the sixth and final stage over 169km in the city of Guilin.